John Alexander has lived with Parkinson’s Disease for seven years. To help control the symptoms, he actively began distance cycling and has ridden about 4,000 miles. He’s also completed two triathlons and climbed a mountain in Scotland. 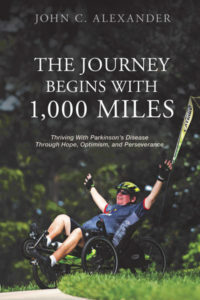 John’s book, “The Journey Begins With 1,000 Miles – Thriving With Parkinson’s Disease Through Hope, Optimism, and Perseverance,” was published in August 2017. It is available from Amazon.com in both print and Kindle versions. John is available to speak to companies and organizations about overcoming adversity through resilience and perseverance. He has received many compliments for his interesting, entertaining, and inspirational style of delivery. You were diagnosed with an incurable disease? You had a major setback at work? Cope as best you can and hope things improve? Was diagnosed with a progressively degenerative neurological condition for which there is no cure in 2010. It is known as Parkinson’s Disease. He chose to fight back with a focus on activity, inspiration and advocacy. He chose to THRIVE. Having worked in the corporate arena for over forty years, John faced many challenges in business and also used the concept of thriving to overcome those and prove to be consistently successful.